Club Penguin Cheats by Mimo777 Club Penguin Cheats by Mimo777: Club Penguin 250th Newspaper & Mountain Expedition! 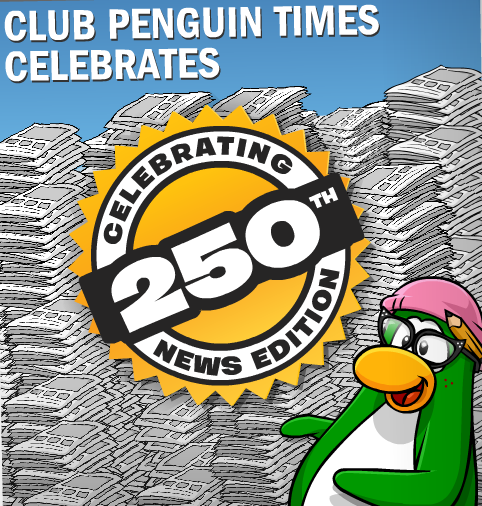 Club Penguin 250th Newspaper & Mountain Expedition! Wow! 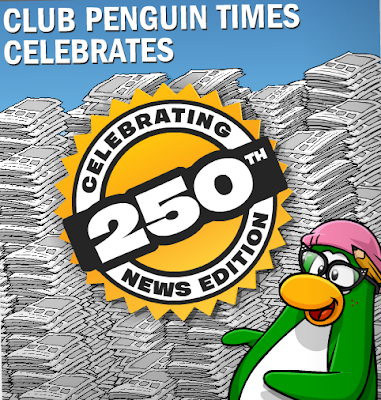 This is the 250th Edition of the Club Penguin Times! How sweet is that? 1. The newspaper used to be in black and white before December, 2005? 2. Other penguins have written my advice column? Gary the Gadget Guy and Rookie! 3. The PSA used to hide secret messages in the newspaper?" She goes on to say "Thanks again to everyone. Keep an eye out for big changes in the future..."
Hmm, what "big" changes could the Club Penguin Times be undergoing? Woot! Mountain Expedition! Awesome! Do you think this is like the Festival of Flight, a new party or maybe just a new room? I can't wait to hear all your theories. Play Fun Virtual Worlds for Kids Now! Click to listen to Mimo's song: "Zebras Smell Funny!" Oh! Probably a new room... For members only. Awesome is what I can say! And I know there will be a pin celebrating this! I mean really, that's almost 250 weeks Club Penguin has been around! This is a HUGE moment! Also, I think the 'WARNING: SECRET REVEALED!' part of the paper this week is pretty darn cheap. It says that in the stamp books already! I read a section of it and I was wondering...how do I change the clasp of my stamp book? I think Mountain Expedition is a new room, with maybe a new adventure? Maybe a ziplining game! Wouldn't that be awesome? Your penguin is on a zipline and you control how fast it goes, and you have to pick up items along the way! But if you run into clouds...Uh-Oh! You lose a life! i hope the mountain expedition is a party! i hope its the festival of flight because when that was going on my membership had just expired AND I WANTED THE JETPACK! o wait, it might be the new place for card jitsu snow? because its high up? This is awesome and yes this could be a new room! I hope its a new room. And I kinda hope its members only, cuz all u guys that are non members keep complaining on and on and on. If you really want to,you can become a member by paying from your pocket money. I mean its only $30. So if you don't become a member please don't annoy them, and if you are, be happy for it. I pay my membership from my allowance. You need to be a member. I hope its the snow temple! OH MY GOODNESS I'M SO EXCITED! maybe its new snow card jitsu room?!?! What does Mimo think then? i think its got something to do with the snow ninjas. Sheesh Saavy dont be negative like that. I think it's going to be an adventure to the tallest mountain. Personally I think it's the new Card Juitsu Water Room.Because remmeber how Card Juitsu Fire started out the same way. There was a volcano we thought was going to blow up. And then it was declared safe and Sensei said it was the new room for the Fire Dojo. Mimo I think it will be a new room AND a new party. Or maybe it will be like the cave expidition? Yeah! That's about 5 YEARS! They have to make a pin for it! everyone moaning about cp member rooms, STOP IT cos we have to pay money for these priveliges, so buy a member shipif your annoyey! That would rock! But clouds? Aren't clouds, like, air? xD Maybe Jet Pack Adventurers! Then they would both lose! Lol! i think is ninja snow place like the fire we have now. hi mimo THIS IS SO COOL!!!! The Big Change is that the newspaper will become Members Only. Then the Mountain Expedition will be released, but for Members Only. Its probably for the snow ninjas thats what i think AND thats the day i lose my member ship ;( but my mom gets me it like a week later so cool? it looks like the tallest mountain from the first mission of the club penguin psa. its probably a new room. hm good idea! your probably right saavy! because it has snow on the top of it on the tip. AHH! YETI! Oh wait, thats Herbert. I don't like the looks of this. The festival of flight was my favorite party. And if its a members only room, CP will lose more ppl. Sorry if this is spam. card jitsu snow or new member and game maybe. I Think Its Gunna Be The Snow Dojo Or Even A New Room Like The Talllest Mountain ! I think that it will be a game and a room to the tallest mountain! Do you remember the first mission? I think it will be that! This is awesome! But I have know idea if it will be a member nonmember both? But this is gonna be great! Bet you the new room is for members only. MIMO! If you wait while choosing an Aqua grabber level, the giant squid goes past!!! It appears on your radar. mimo i think after the mountain is climbed i think it will be the snow dojo.but first a party a big one and a scavenger hunt like the fire dojo scavenger hunt except we will find icy things not hot things. I think at the top of the mountain will be a lake and have to do with Card Jitsu Water! jutsu waater or ice on the mountain sesie is opening ice and water on that mountain it maches the one besides the volcano!!! i think its finally going to be the water dojo for members only. I bet it's a rom for Snow Card-Jitsu. Yeah, maybe. I still think it's Card Jitsu! That's members too. I know, right! I don't think it's gonna be another members only room! That wouldn't be smart of Disney! I bet so too! bet all my jelly beans and twinkies (I take my risks, :O) that it is! I think its a new room too. And I wouldn't be surprised if it was for members only... I think the little mountain with the path at the dojo has something to do with the mountain expedition. I agree! I am seriously TIRED of all this member complaining! A 1 month membership is only 5$! It HAS to do with Card-Jitsu Snow. I know water is next on the amulet, but maybe it is just to fool us? You mean the snow dojo? Same here! I want the snow outfits SO bad! The fire outfits are kind of... duds. It MUST have to do with CardJitsu Snow. Water is next on the amulet, but maybe its just to fool us? That's what I am thinking! Hopefully I don't need to be a fire ninja because I gave up on that! And I gave away all my gold CJ codes! Not too many exclamation marks! No matter how exclamatory you are! xD I agree! Snow ninjas, here I come! Yup- that's what everyone thinks! And I have a pretty good hunch it is! *turns around and shows hunched back* Told you so. That's a great question that nobody can answer. It is impossible to know what the Mimo is truly thinking. My best guess- chocolate covered monkeys fighting with twizzlers. I hope it is too! And you know, you can click the name/url button and just fill in your name, Greenncool! Then you don't have to have it as anonymous! Woohoo! Ice rules! Except when it's REALLY cold out and the dumb person who gave you a drink put way too much ice! Yeah, those are my best guess! Yeah! I mean. it's COVERED with snow! What else could it be?! Wow! Nice run on sentence! 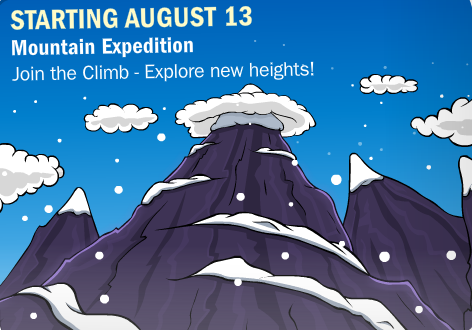 :D I don't think water will come out first because it says the Join the Climb on August 12th or whatever! They wouldn't really have enough time to release both by that time. That's what I think too! Maybe CP will make it non members too? MIMIO I got 99 stamps all of them except the characters.Ist that awesome. That stuff is probably members only. I am so tired of club penguin treating nonmembers like this! Non-members should at least be able to buy clothes. its ither a new game or a mase. Hey Mimo! The Compass Pin may have to do something with the Mountain Expedition! Like it leads you to someplace. That is what compasses are for. You mean Card Jistu Snow/Ice. P.S. Have you noticed the mountain behind the Dock(um I mean background)? I knew that they were gonna make a big deal over the 250th newspaper cuz last week it said on the front of the newspaper, "Issue #249". That gave me a hint that there was going to be something going on, and probably a new pin too. I hope that this mountain expedition party is for members AND nonmembers. Wouldn't it be cool if CP made a nonmembers only room? That would be awesome, but we know thats never gonna happen. And BTW u know the secret page in the stamp nook? 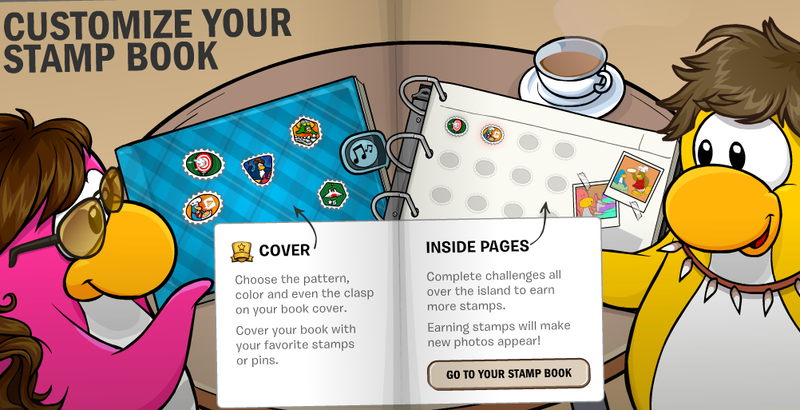 Well wouldn't it be cool if it was sorta like the Treasure Book and Field Op where you could use your stamps to buy clothes, puffles, exclusives, etc. I think that would be awesome!!!!! I know this is sorta off-topic, but for the Treasure Book, if u get a Series 2 toy does it unlock the Series 2 Treasure Book? And if it does, where can u buy Series 2 toys???????? Remember how in the old psa there was that ONE not working monitor? That room probably was going to be there before the psa blewup! But since psa got blown up they never got a chance to fill that last monitor! Remember when you showed us the Card Jitsu Water Tin's. Well when you goto the Dojo Court Yard you can see the water fall and it is on a Cliff. So I think that the Expedition will be us climping to the top of the water fall and then we start Card Jitsu Water! i smell a snow element, but i'm havin trouble getting fire done! I think the mountain may be part of the new game for card jitsu. Card jistu ice or snow. Thats my theory. Maybe they will have other things to do also too. Even for non-members hopefully. Yea it must be a new room....... CANT WAIT! Good thinking. Why didn't I think of that? or snow- card jitsu snow!! they care for it because the money members pay to be a member helps keep club penguin running! if there were no members- club penguin would have more of a chance closing down. when you click on the pencil to edit your book, there are the options for the cover right? one of the options is to change that. its the bottom one i think. mines the music notes! wow. just cuz he said he shouldnt annoy members and that you can use your pocket money makes him a bad person? he still cares for others im betting, and why does a cp membership relate to food, and people starving? when he says pocket money, he means money you already have- or some you can EARN. im really sick of you guys always pretty much dissing members. how do you think members now feel, when people are making em feel like poop?!?!?! you guys always seem to terribly bring members into anything thats new!! I hope it is Card Jitsu! Maybe Card Jitsu Ice will be up there? ~~~~~~~~~~~~~~~~~~~~~~~~~~~~~~~~~~~ No it isn't because no you can't collect anymore for a month. wow. . . i remember when it was the 150th edition. Those were the good ol days back in 07. Awesome news about the mountain exhibition! I think once penguins have reached the top of the mountain, they will discover the snow dojo and start card jitsu snow! I dont think it's snow, because the water card jistu cards came out or something, so why would they bring out the SNOW dojo?!?!?!?! yay i hope its new room for members and nonmembers i am a member but too bad it will expired lol!! Maybe another members room ._. i think it is a maze to get up the mountain to go into card jitsu ice. it will fill in the mystery page of the stamp book. proably going to be for members only again why do they make these things members only why!!!!???? Its the snow dojo I can feal it! that it might be refurbishing a new room like what they did with the dojo !!!!!!! New Magical Game from the Creators of Chobots! Club Penguin August Sneak Peek! Club Penguin 2" Mix N Match Series 9 Toys! Club Penguin Pin Cheat - COMPASS PIN! Club Penguin Community Garden Tree Grows Again! Club Penguin Favorite Pin Reviewed By You! Club Penguin Double Coin BONUS! Club Penguin Weekly Field Op Number 7 Cheat! Club Penguin Game Updates For Members! Club Penguin Stamps Cheats Are Here! Are you on Facebook? I am! Let's be Friends! Club Penguin Pins Vs. Stamps. Which Is Better? Club Penguin Underwater Adventure Postcard! Club Penguin Band Reviewed By You! Club Penguin Underwater Adventure Cheats! Club Penguin's Happy77 Talks Stamps! Club Penguin Lots o' Member Only Changes! Club Penguin NEW Weekly Field Op Number 6 Cheat! SHADE & HIS SHADOWS INVADE TOOTSVILLE! Club Penguin Adds More Stickers! Club Penguin Pin Cheat - TAMBOURINE PIN! Another Update to Club Penguin "Collectibles!" Club Penguin Dance Style Reviewed By You! Club Penguin Series 9 Treasure Book Cheats! New Club Penguin Music in The Night Club! New Club Penguin "Collectibles" UPDATE! Club Penguin Weekly Field Op Number 5 Cheat! Interview with Club Penguin's Billybob! New Club Penguin "Collectibles" Coming! Club Penguin Missing Candy Apple Pin! Club Penguin Music Reviewed By You! Club Penguin Field Op Number 4! Club Penguin World Cup Soccer! Who's Into It? Club Penguin Toys and Collectibles! FINALLY! Mimo Made A Club Penguin Pin Finder! Club Penguin WEEKLY Field Ops!